There could be all sorts of reasons why you might need cheering up right now. There’s a lot happening and no point in going into specifics. Whatever ails you, though, there’s a game to make everything better, and we’ve gathered some of the best for you here. From happy farming to joyous adventuring, shouty multiplayer fun and more. Take a look, have a play and forget whatever it was you were worried about, at least for a while. It’s hard to not to be happy when you’re basically farming big smiling faces. This is a game full of colour and fun as you bumble around a bright landscape chasing various wild slimes to catch, feed and breed. Then you plow the profits back into you farm, buying more plots, new gear and other tools before heading out to find more slimes. It’s a simple, easy loop that’s satisfyingly absorbing and, oh God, so cheery - for a few hours all you’ve got to worry about are bouncy cheery creatures laughing and chirping around you, and maybe the odd escaping chicken. From the moment Tearaway reveals its papery charms it’s impossible not to grin. Everything in this world is folded and torn from paper, creating a charming origami landscape designed to cheer the bleakest mood. Whether you're throwing paper acorns at squirrels, or bouncing across rustling platform sections, the tale of Iota (or Atoi) trying to deliver their message is a lovely experience. It also makes beautiful use of both the Vita and PS4 to draw you into that world - tapping drums, or appearing in the sun via the camera. Plus, it’s got one of the most heartwarming endings of all time. Screaming at your friends until you’re blue in the face might not sound like a recipe for happiness but trust us - this is one of the best ways to spend time with the people you love. 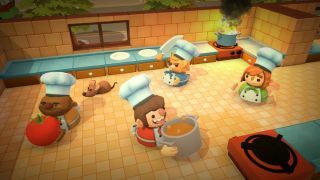 The way Overcooked brings everyone together to prepare and serve food is a beautifully designed chaotic mess of tomato soup and unwashed dishes. You’ll shout instructions about what to chop, howl when the ingredients aren’t put in the right place, and then all laugh when you inevitably fail. This is hands down one of the best multiplayer games in years and can’t fail to put a smile on you and your mates’ faces. This is as much an experience as it is a game. Flower uses its wonderfully crafted visuals and music to induce an almost euphoric state as you guide your flying petals through lush grasslands. The marriage of sound, colour and movement create some intense emotional responses as plants burst into bloom and the music surges in response to lift you up. It helps that the controls are ridiculously simple - you just fly and glide, reacting to the world around you and, losing yourself in simple, joyous bliss. Skipping around lush planets dotted with gently shining colourful metal structures, swinging your wrench into a couple of easily-defeated Blarg officers: it doesn’t get much better than this. Because Ratchet & Clank know exactly how to put their players at ease. Vivid colours and charmingly witty dialogue make sure you never feel too crowded with enemies. After you’ve finished clearing the area the satisfying clinking sounds nuts and bolts make as they float towards you make you feel quietly productive and content. Like putting on a cosy jumper you’ve worn for years, Ratchet & Clank simply makes you happy. Not because it’s easy, but just because it flows beautifully and is utterly comfortable being itself. Who knew that paying off a mortgage could make you this happy? There is nothing like loading up Animal Crossing after a long day of actually paying off a mortgage. Everyone is always pleased to see you, even when it rains it’s nice to pop up a cute umbrella, you get presents from Nintendo and there’s something just incredible happy making about taking a walk by the beach of your town with only the peaceful music plinking away and the gentle lapping of the waves. For peak happy, invite a friend into your town and go watering the flowers together or make them run into a minefield of buried pitfall seeds. It’s up to you. TT Games must force feed its staff Red Bull. It’s the only way to explain the sheer dizzying sugar high that is Lego Dimensions. From exploring Oz with Batman - he doesn’t like the Scarecrow - to battling The Joker in The Simpsons’ nuclear power plant, this super mash-up of pop culture is a genuine joy to behold. It’s the little moments where you’ll find the most happiness too. Sonic’s original jumping noise, Gizmo singing gently as one of his idling animations, the word Lego written inside Adventure Time’s Jake’s arm. And the fact that you get to build the tiny vehicles in each pack with on screen instructions? It’s like a mental hug in a little box of plastic bricks. Rayman Legends is the game that proved that the elusive ‘Nintendo magic’ isn’t necessarily the sole preserve of the Kyoto dream factory. Blending the creative, pacey, precision platforming of Mario with the speedy acrobatics of (good ) Sonic and Prince of Persia, Legends is nevertheless a game all of its own, endlessly imaginative with its level designs and themes, and constantly good-natured and belligerently fun (and funny) in its vibe. And it’s no exaggeration at all to state that the blistering craft of its music-synched levels delivers the greatest, most exhilarating rhythm-action gameplay since Guitar Hero first became a thing. It’s a game clearly made with nothing but love, and it makes sure you feel that with every second you play. Journey is a game of many dramatic, emotional ups and downs, but ultimately, an upward curve to absolute joy is its underlying – and eventually explicit – purpose. For every genuinely terrifying, ‘undersea’ assault by rumbling, malignant giants of the deep, there’s the overwhelming wonder of finding yourself suddenly ‘snowboarding’ over shimmering sands. For each missed jump, there’s the genuinely affecting companionship of a nameless friend to share the experience with, waiting there for you on the other side, both of you knowing that you‘re going to get through this together. And then there’s the ending. Oh God, the ending. I will say no more, but by the time you reach the end of the credits, you’ll be feeling everything at the same time. On days where nothing seems to go right, sometimes all you can do is grow a perfect parsnip, and that small act makes everything else seem manageable. How you spend your time as a resident of Stardew Valley is up to you: raise livestock, grow crops, or spend all day digging for diamonds in the mine, head to the beach for some fishing. There's plenty to do, and some of it is very, very weird. There's a mouse who wants to sell you hats, and a mutant carp in the sewer. There's a mayonnaise-loving goblin and a sand dragon in the desert. Uncovering the many secrets that lie beneath Stardew Valley's super-cute exterior is a delightful pursuit that will devour your free time like a cow sucking down hay. Trouble in Paradise shares the "collect-em-all" gameplay of Pokemon, but instead of trapping animals inside balls, you're persuading them to reside in your garden by plying them with fruits, flowers, and the promise of romance. Enchanting bigger pinatas - all named after desserts and sweets - is as complex a task as besting a boss in Dark Souls, requiring patience, planning, and the willingness to make sacrifices. The patience pays off, because it’s impossible to be glum when your garden is filled with bright paper animals in as many colors as you can imagine. (And the sound of a snoring Buzzlegum is basically *the best thing ever. *) Both Viva Pinata games are charming and give you the freedom to create whatever kind of habitat you like, but Trouble in Paradise not only smooths out some mechanical issues, it also adds snow and desert pinata. Pengums and flapyaks, people. What more could you want?